Managing your project's budget and measuring key project performance metrics is what Earned Value Management (or EVM) is all about. It helps you know whether you can truly say "On Time and Under Budget." The basic idea is to compare your costs to your budget in a way that takes into account your project schedule. This is particularly important when you are not going to be spending money at a constant rate. Earned Value Management can help project managers identify problems early on as well as forecast the cost of a project based on current progress. If you are familiar with the Earned Value Management System, go ahead and download the template. Otherwise, keep reading below to learn more about the EVM system. 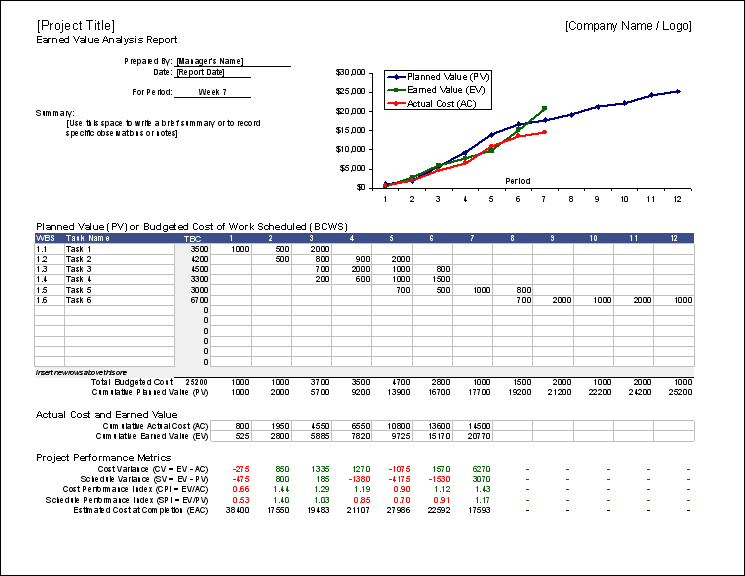 This template demonstrates the use of EVM formulas to run a basic earned value analysis and monitor spending over the life of a project. Start by adding tasks to the Planned Value table and entering the amounts that will be spent on the tasks each period. After you are done defining the tasks and the budget, enter the same set of tasks in the EV (Earned Value) and AC (Actual Cost) worksheets. At the end of each period, you'll enter a percentage complete for each task in the EV worksheet, and the amount spent on each task during the period in the AC worksheet. Transfer the cumulative EV and AC to the Report worksheet and analyze the graph, comparing the EV and AC to the Planned Value. If you haven't already defined your project schedule using a Gantt chart, we recommend that you first download Vertex42's Gantt Chart template. The Gantt chart is used to define the project schedule (WBS, Tasks, durations, and task dependencies), while the EVM worksheet is used for planning and tracking your spending. Planned Value (PV): This is the Budgeted Cost of Work Scheduled (BCWS). When you create a project schedule, you assign a Total Budgeted Cost (TBC) to each separate task. For long-term tasks, this cost may be spread out over multiple periods and may not always be linear, so the Earned Value Management Template lets you indicate the budgeted cost for each period and it calculates the TBC for each task. The Planned Value is the baseline that you will be comparing to. Actual Cost (AC): The Actual Cost of Work Performed (ACWP) is the amount you have spent, including labor and materials and other costs. The Actual Cost alone does not tell you anything about how much work was actually completed, but it's still a very critical number to report. Earned Value (EV): This is the Budgeted Cost of Work Performed (BCWP), or in other words, the value of the work completed. The project manager must come up with rules for how to assign the value. In the Earned Value Management Template, the EV is calculated by multiplying the % Complete by the Total Budgeted Cost (TBC) for each task. Figure 1: Chart showing cumulative Earned Value (EV), cumulative Actual Cost (AC), and cumulative Planned Value (PV) for a sample 12-month project. The rules you use for assigning earned value are highly dependent on how you define your project tasks. If you use a good work break-down structure, assigning earned value may end up being a lot easier. For example, if you had a task called "Purchasing" that spanned the entire project period, the planned value for that task would be highly nonlinear. You might spend $5000 at the start, then $1000 during month 2, then $2500 during month 5. The TBC for that task would be $8500. Assuming the purchases were made on schedule, the % Complete for that task as of month 2 would be ($5000+$1000)/$8500. If the actual cost of that initial purchase was only $4500, the Earned Value would still be ($5000+$1000). The $4500 would be included in the Actual Cost. That is how you end up knowing whether you are under budget. Alternatively, the project manager might define "Purchasing" as a separate category of tasks, with each large purchase as a sub task and another sub task for miscellaneous purchases. Then, whenever each purchase is made, it is a simple matter of marking the appropriate task as 100% complete. Keep in mind that just because a task is 50% complete does not mean that it has earned 50% of the value. Think of an open heart surgery and you'll get the idea. It is common to give more weight to completing a task than to just starting it or being half-way done. Earned Value Management at wikipedia.com - This is a pretty thorough article, with definitions of acronyms and EVM formulas.